In our previous post (part 2), we took a quick overview of the physiology of fasting. I’d like to take a more in-depth look at some of the studies that have been done to really try to understand what is actually happening when we fast. Today I want to focus in on human growth hormone (HGH). HGH is a hormone made by the pituitary gland (the master gland). It plays a huge role in the normal development of children and adolescents as the name implies. However, it also plays a role in adults. HGH deficiency in adults typically leads to higher levels of body fat, lower lean body mass and decreased bone mass (osteopenia). HGH only lasts a few minutes in the bloodstream. It goes to the liver for metabolism, where it is converted into a number of other growth factors, the most important of which is Insulin Like Growth Factor 1 (IGF1). Growth hormone is typically secreted during sleep and is one of the so-called counter-regulatory hormones. HGH along with cortisol and adrenalin tell the body to increase the availability of glucose – so it counters the effect of insulin. High doses of HGH, (or cortisol) will produce higher blood sugars. These hormones are typically secreted in a pulse just before waking (4 am or so) during the ‘counter-reulatory surge’. Remember that all hormones exhibit pulsatile secretion to prevent the development of resistance as we covered in a previous post. Since HGH typically goes down with age, there may be some benefit to giving HGH for its ‘anti-aging’ effects. Perhaps this decrease in HGH-IGF1 may contribute to the decrease in lean body mass both in lower muscle mass, but also lowered bone mass. 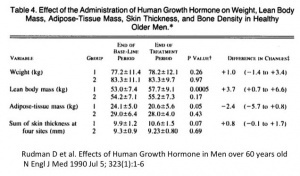 So, what are the effects of giving HGH in older people? This was studied in 1990 in a New England Journal of Medicine article. HGH is difficult to measure since it is pulsatile, so IGF1 can be measured as a surrogate. Healthy men with low IGF1 levels were given HGH for 6 months and the effects measured. Group 1 is the HGH group and Group 2 is the control group that did not receive HGH. Over 6 months weight overall did not change between the two groups. But look at the lean body mass. Compared to the control, the HGH group packed on 3.7 kg (8.8%) more lean mass. That’s 8 pounds of lean mass! Fat mass decreased an extra 2.4 kg (5.3 pounds)! Thats a decrease of 14.2%. Even the skin thickness improved. That’s anti-aging, baby! In a 2002 JAMA article, similar results were obtained in women as well. There was a decrease in fat mass and an increase in lean mass. Sounds pretty great. So, why aren’t we using it for everybody? Well, there’s a little thing called side effects. In 1982, Kerndt et al published a study of a single patient who decided to undergo a 40 day fast for religious purposes. They measure numerous metabolic indices over that forty days to see what happened. There is a wealth of data here, but several notable things. Blood pressure slightly decreased. Glucose goes down. From 96 initially, it drops to 56. Insulin goes way, way down. Starting at 13.5, it quickly drops to 2.91 and stays down. That is almost an 80% drop! Glucagon goes from 139 to a peak of 727 or a 423% increase. But our concern here is HGH. It starts at 0.73 and peaks at 9.86. That is a 1250% increase in growth hormone. Even with a relatively short 5 day fast, we are talking about 300% increase. All this HGH increases without drugs. What about the potential side effects? Increased glucose? Nope. Increased blood pressure? Nope. Higher risk of cancer? Nope. Other studies have shown the same increase in growth hormone. In 1988, Ho KY et al studied fasting and HGH. On the control day, you can see that meals (marked M) very effectively suppress HGH secretion. This is to be expected. 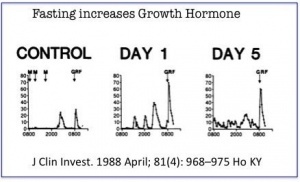 Like cortisol, HGH increases glucose and thus is suppressed during feeding. Fasting is a great stimulus. During fasting, there is the spike in the early morning, but there is regular secretion throughout the day as well. Hartman et al also showed a 5 fold increase in HGH in response to a 2 day fast. This HGH is crucial in the maintenance of lean mass – both muscle and bone. One of the major concerns about fasting is the loss of lean mass. This does not occur. In fact, the opposite happens – there is likely an increase in lean mass. Think about this for a second. The logical thing to do is to start burning the stored wood. In the case of the body, we start to burn the stored food (fat stores) instead of burning precious muscle. This has enormous implications for athletes. While studies are few, it is possible that the elevated HGH stimulated by fasting will increase muscle mass as seen in the earlier studies on HGH administration. This would be an important advantage in elite level athletes, and we are seeing more and more interest in doing this exact sort of protocol. The recovery from hard workouts would similarly be improved. The increased adrenalin during fasting (to be discussed in future) will also allow you to perform a more intense workout. It will make workouts easier and recovery faster. For example, Brad Pilon, who wrote the fantastic book “Eat, Stop, Eat” is a bodybuilder, as is Martin Berkhan, who popularized the ‘lean gains’ method of fasting. Somehow, I don’t think that fasting for these two fellows was ‘eating’ their muscle. So, let’s see. Train harder. Lose Weight. Faster recovery. Decrease insulin and insulin resistance. Decrease sugars. All of these benefits are achieved without drugs, supplements or cost. Yes, like all the best things in life, it’s free. So why is everybody so against it? Ever since I’ve started to fast, I’ve noticed I wake up around 5am almost every night. I wonder if this has to do with that growth hormone pulse around that time. Norepinephrine and Epinephrine are released when insulin levels are low. It probably has to do with the fact you’re hungry lol. Does 2 day fast increase height in teens males ? So…how does IF affect the GH levels of people over 60? Is it advantageous to supplement with some arginine or ornithine on fast days? Does the major concern about fasting causing the loss of lean mass perhaps come from people doing JUICE FASTS? – drinking “healthy” sugar all day and preventing HGH spikes? The amino acids in the the first 24 hours or so will come from the diet. After you have eaten, you have excess circulating glucose and AA. The glucose will get used. The AA will get used for gluconeogenesis, unless you took in absolutely zero proteins in the last 24 hrs, which is not really all that healthy since there are certain essential amino acids. After the first 24 hours or so, the rest of the gluconeogenesis substrate comes from glycerol. Thank you!! That makes sense. I did hit the gym today after 19 h of fasting, and while I hardly have put in their efforts or have their results, at least I got it done today. I overlooked that you are a type-1 diabetic. Of course, you do need insulin! My apology. Is tight blood glucose control the correct goal to guide your therapy efforts or is periodically lowering blood insulin the correct therapeutic goal? I believe that Dr. Fung is arguing that the latter goal is the correct approach to treating type-2 diabetes. I routines list weights and exercise after 16 to 24 hours fasts with no ill effects. I believe I am actually somewhat stronger due to the fasting. I would point out that most of the studies of fasting have included many women as well. Clinically, I see no difference in men and women and fasting. I think the LeanGains style of fasting works perfectly fine. For some diabetics, with severe insulin resistance, it may not be powerful enough. For somebody just trying to lose a little weight, I think it should be fine. Fasting comes in infinite varieties but usually comes down to – if you do more fasting, you lose more weight. Since you obviously don’t have any problem with extra weight, do you yourself follow a fasting regimen? Do you fast at some interval as a “preventive” measure? Yes, I generally do 1-2 24 hour fasts per week. If I have overindulged, I may do a few extra to make up. Yes – I do it for preventive measures against diabetes, but also to stimulate growth hormone, to lower insulin and to increase autophagy (to be discussed later). Thanks for your reply. I have looked up “autophagy” and you have piqued my interest… I’m staying tuned! What’s your take on the heart failures reported in fasting studies (such as the ones described at http://paleoleap.com/long-fasts/ under Dangers and Drawbacks) ? I believe many overweight people have some genetic conditions, and the only solution is to be very careful with your diet. Did you try fasting, even intermittent or alternate fasting, already ? Would it be a silly protocol to take a little bolus insulin with meals on the basis that it’s short acting and will flush out of the system soon but could provide some protection against tissue damage, and then stop taking insulin on fasting days to regain insulin sensitivity? Or does that basically make sense? I suspect that this have to do with glucose and insulin? How to improve this? Headaches are quite common when starting fasting. I do not know why. However, with repeated fasting, it often goes away. Staying hydrated, especially with bone broth or mineral water seems to help. Doesn’t bone broth break your fast, technically speaking? Dr. Jason Fung: Technically, perhaps. Clinically, it seems to make no difference. Headaches are common because with fasting all the toxins are released into the blood stream very fast. If you do an enema and drink lots of water – they disappear as you flush them out from your gut. Hi, Im new to all this fasting protocol/s. I have read all the info that Dr. Fung writes, which I think is amazing! There is something I still don’t understand. If somebody with type 2 diabetes fast, will not be more at risk of having ketoacidosis ending in coma? That part of the human physiology I don’t get. Thank you! Hi! Dr. Fung, is fasting suitable for who have type 2 diabetes already? Thank you! Yes, but you must be very careful with your medications to avoid low blood sugars. You should only fast with close medical supervision in that case. This is exactly what the fasting (IF) will cure but only when waistline reduces I understand. Measure waist instead of weight! I have been on an 18:6 IF fast for about 3 months and record daily blood glucose (mg/dl) and recently fructosamine, A1C, Lipid panel. Yet lab test health paramaters have all have improved. body -20 lbs, %body fat -8%, fructosamine, A1C NORMAL/good, Lipid panel NORMAL/good, Resistance exercise show improvement in wt/reps and reduced level of difficulty. Conclusion: I think IF increases HGH which increases blood glucose but increase is non problematic because fructosamine/A1, Lipid panel levels remain in Normal/good range. Just an FYI. Have you tried recalibrating your meter or taking a few test in a row to see variation? If the three numbers vary widely, it may be your meter or strips. Just something to check. Your liver produces glucose, it doesn’t just come from food. You need to stick with the fasting untill you lower your insulin levels and increase insulin sensitivity. High ferritin levels will also reduce insulin insensitivity . Try donating blood to bring down your ferritin levels. One reason people need to remain on these IF protocols may be that their body iron levels remain high. Dr. Jason Fung: I think you are confusing Growth Hormone (GH) with IGF-1 (Insulin Like Growth Factor 1). 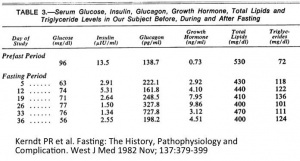 They are quite different Fasting increases GH but decreases IGF-1, as well as insulin. I got the answer to my previous question. But I still need to understand the difference because you talk about “decrease in HGH-IGF-1” in the article and using IGF1 measurement as a surrogate for HGH. So that is where I got confused. Shall reread article plus a bit more research. Very interesting article, I had no idea that HGH became elevated during fasting or the role it played in healing the body. Levels of HGH have been measured as high as 1000x higher than average in people fasting for several days, but what about intermittent fasting ? How high does HGH get ? Always been a big fan of your work and especially this one. I’m interested in boosting HGH levels from a bodybuilding point of view. What would you recommend to be the most optimal fasting protocol to maximise muscle gains? Thanks and I look forward to your reply, doctor!